This design incorporates elements of the book cover, designed by Matthew Dickerson. It starts with a growl – sometimes soft, sometimes loud – and a feeling of coming together to share in the experiences of womxnhood in its various forms. She Grrrowls is a place to feel empowered and energised, whether in the pages of the book, or as the words come alive on stage. She Grrrowls gives voice to the experience of different womxn as they read newly commissioned work published in She Grrrowls: The Anthology (Burning Eye Books) alongside existing work. Exploring topics such as what it means to be a ‘good woman’, how sexual violence is interlaced with childhood nostalgia, and the importance of sisterhood and relationships that make us stronger, be prepared to laugh, cry, and sometimes squirm. 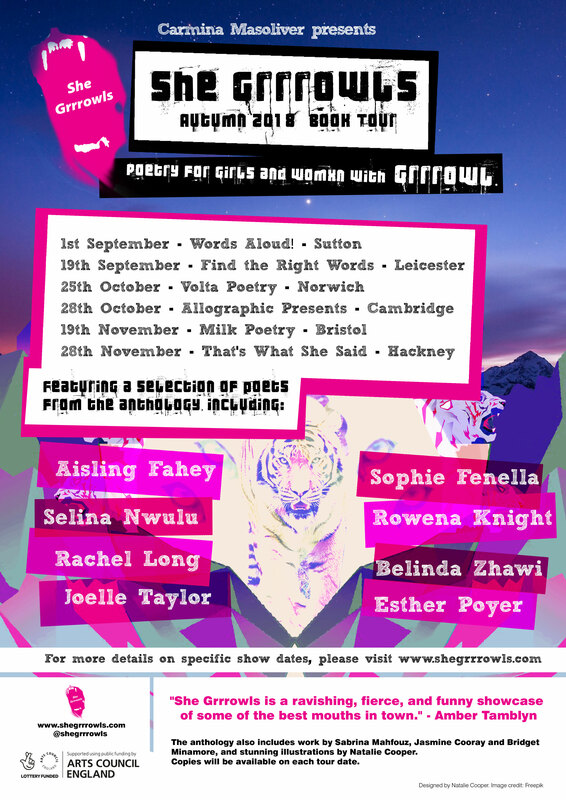 Hear a selection of these powerful voices as part of the She Grrrowls Autumn 2018 Book Tour, and discover more within the pages of the book, featuring ten beautiful illustrations. Through this emotional journey of poems that pack punches, you will come out the other side feeling ready for whatever the world throws at you. Edited by Carmina Masoliver, and published by Burning Eye Books in 2017, thanks to funding from Arts Council England, we are celebrating the publication across six different dates. The anthology also includes work by Sabrina Mahfouz, Jasmine Cooray & Bridget Minamore. Featuring stunning illustrations by Natalie Cooper, copies will be available on each tour date.